I thought I would change the title of these posts to “Baby Summary” instead of “Newborn Summary” since McKenna is no longer a newborn. This week had its ups and downs. 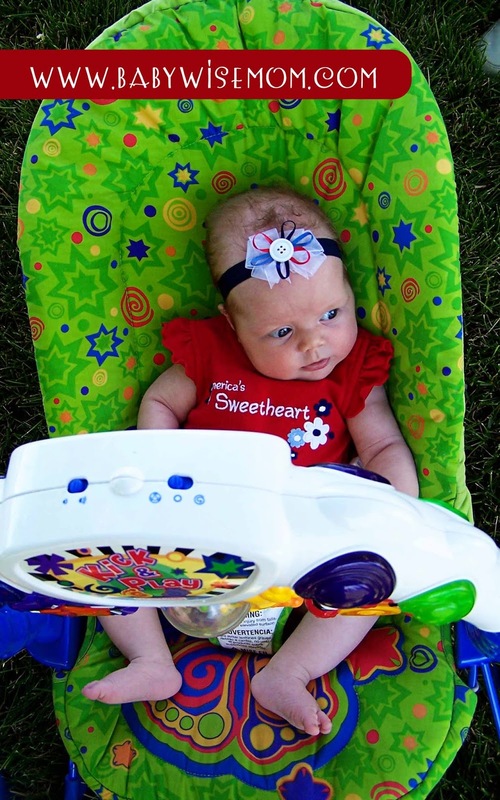 McKenna is losing that newborn ability to sleep well wherever she is, so disruptions are more disruptive to her. McKenna was less social this week while nursing. She did, however, sometimes seem to not eat as much at a feeding. Naps started really well. I was having to wake her from most naps. I even made the mistake of thinking, “I think we might be past the times of short naps.” HA! Don’t ever think that. After a weekend of disruptions, it took her a few days to get back on track. But she got there. Waketime lengths stayed the same. I did notice the extreme importance of her first waketime, though. It really needs to be 50 minutes–absolutely no more. If it is more, she doesn’t nap as long for her first nap. McKenna went back to waking early in the morning. I would feed her from one side only and then put her back to bed. By the end of the week, she had woken at the same time almost to the minute for a few nights in a row. I wasn’t worried about this early morning waking, however, because she had a cold. Yes, this is her third cold in life! Poor thing. I think Brayden was older than a year old before he got his first cold. This is the nature of having siblings to bring sickness home. I try to keep the kids away if they have colds, but they just love to kiss her and hug her and it is impossible to guard her completely. On a positive note, Kaitlyn had more colds as a baby than Brayden but that has translated into fewer colds as a toddler. And while McKenna was waking aroun 5:30 AM, I thought things could be a lot worse. McKenna rolled over this week! It always takes me by surprise for some reason when my kids do this for the first time. Since McKenna is currently the youngest of three, she also just seems young to me. She is a couple of weeks away from 4 months, which is the age Brayden and Kaitlyn started solids. She is still a baby! I can’t imagine her eating solids right now. I find the psychological aspect of placement in the family so interesting. McKenna started waking happy from some of her naps this week. She wakes up and coos. If your baby isn’t doing this by this age, please don’t panic. Babywise says baby starts to wake up happy around 5 months. A poll I did almost a year ago, however, had 42% waking happy somewhere from 3-4 months old. See Poll Results: At what age did baby start to consistently wake up happy from naps? . I am so happy to report that the witching hour is over! We no longer use the swing at all. I am going to spend some time reflecting on the witching hour experience and will write a post on it in the future. We are still swaddling. I know that is nothing to report, but this is an age where parents constantly consider dropping the swaddle, so I thought I would make it clear that we still are. I am, however, closely watching and monitoring for the time to stop. Kaitlyn was around this age when we stopped. I will wait until I am confident she has good control over her arms. I am not sure she will be one to slowly wean (with one arm out at first). She uses one hand to hold the other hand in her mouth, so I think leaving just one hand out would frustrate her. I don’t think there is any rush to drop the swaddle. Some moms swaddle up until a year old! I do want to drop it as soon as she is ready for it, but I am not going to drop it until we can do so without causing problems to sleep. One exception I would make for this rule is if she started to roll from front to back while swaddled. It would then become a potentially dangerous situation to be swaddled and I would stop the swaddle to maintain safety. This week was the Fourth of July (Independence Day). We always host the party at our house for both my side and my husband’s side of the family. My mom was very awesome. She called me a few days before and asked me if I wanted her to stay at the house with McKenna while we went to the parade. My mom doesn’t feel bad at all about missing a parade. I accepted. This was so nice for McKenna! She literally slept the entire time we were gone for the parade. When Brayden was a baby, he was very overstimulated by the parade; I ended up leaving it early because he was having such a hard time with it. I thought this was very nice of my mom. Next Post Poll Results: Did you ever cluster feed? Thanks for this blog it is awesome. I have a 19month BW toddler (now doing toddlerwise) and a 12wk old who I am establishing on Babywise at the moment. It is so great to follow your Baby Summary as my 12wk old is only a few weeks behind McKenna so I am finding this blog so useful. First, thank you for all your hard work on your blog. It is incredible. I have given the web address out to all my friends with babies/toddlers. I have a little boy about the same age as McKenna (born April 1). He is a chronic 45 minute napper and I'm not sure how I should do his feed/wake/sleep cycle. His wake times are around 60-80 minutues throughout the day. He goes down for 45 minutes, but then we still have about an hour before our next feeding. Sometimes he will go back for a quick nap before the next feeding and then somtimes he will be ready to go down right after his next feeding for another 45 minute nap. He is not fussy when he wakes up and does not seem overly tired. He sleeps great at night. He goes down around 6:30, wakes at around 3 to eat, and then again at 7am. (he's still pretty hungry at the 3am feeding so I will continue to feed him then) This seems to work for us now but I'm worried that when we switch over to two naps (I don't know when that happens)he will continue to nap for only 45 minutes. What should I do? Our first child Sophi is 19 weeks old. Until our vacation, right at 4 months, her waketime was 7am with a dreamfeed at 10pm. During vacation, she started off on schedule, but as the time got longer and her schedule got interrupted by constant going, she would go to bed by 9 and wake at 3am. I would feed her to avoid waking up the house of 10 people and she'd go back to sleep. (Plus Daddy had gone back home for work and baby was in the same room as me-hard to work out!) So I know this pattern started then. We'll now I'm learning.. We've been home for about 2 weeks now and now she is waking up at 3am. Dad goes in to put her back to sleep. She falls right back asleep, but wakes up between 5:30-6 wanting to eat. She goes right back to sleep after eating and wakes at 9. She is on a 3 hour schedule, which makes her last feeding at 9pm. I haven't been waking her at 10 to eat, since she just ate at 9. How do we eliminate the 3am waking and move her back to the 7am wake-time? Is she getting too much sleep?Should we let her CIO at 3am?Should we let her CIO at 5:30am?Just for reference, she's a great napper. She is usually awake 1hr. 15min. and then takes 1hr. and a half/2hr. nap. She doesn't cry when it's time for bed, usually falls right asleep. I've tried to push the awake time longer, but then she has a VERY difficult time going to sleep w/o CIO. Thanks for your help! Jessica,The first thing to realize is that the beginning weeks are just hard. If you are a normal person, you are remembering things with your first son as better than they really were. I remember when Kaitlyn was a baby. I thought, "Brayden was never this hard!" I then looked at my journal from when Brayden was a baby…well, he was much harder! Consistent schedules each day don't really develop until around 3 months because those first three months you have a big growth spurt every few weeks. The spurt lasts a week, you spend a week getting back on track, a week on track, and a spurt happens again 🙂 I have some posts for you to read:Getting a Consistent Schedule: http://babywisemom.blogspot.com/2008/01/getting-consistent-schedule.htmlEarly Morning Feedings Before Waketime: http://babywisemom.blogspot.com/2008/01/early-morning-feedings-before-waketime.htmlWaking Early From Naps/Won't Fall Asleep For Naps: http://babywisemom.blogspot.com/2008/01/waking-early-from-napswont-fall-asleep.htmlWaketime When They Wake Early: http://babywisemom.blogspot.com/2007/11/waketime-when-they-wake-early.htmlConsistent Schedule: Start Your Day Right: http://babywisemom.blogspot.com/2007/11/consistent-schedule-start-your-day.htmlWhat Time Should I Start My Day: http://babywisemom.blogspot.com/2007/12/what-time-should-i-start-my-day.htmlSee also the blog label "CIO"
Jessica,Are you sure there is no reflux? Have you ever considered that? Mama of two, It definitely is NOT normal…but also definitely NOT something to worry about. It is something to rejoice about 🙂 By not normal, I mean the majority of babies are not this way.Ben is just a little older than McKenna. I am glad to hear he isn't (or wasn't) ready to stop swaddling. McKenna still isn't ready, which seems a bit strange to me 🙂 But I know I would tell myself to not worry about it! Ashlee,There are several possibilities. One is that it might be a growth spurt for the early waking. Another is that the pacifier might be intervening with sleep. Many babies start to have this be a major disruption around 11 weeks to 4 months. Many moms choose to drop it at this point. Some don't. See the label "pacifier" for more on that.McKenna started crying somewhere around that age. I don't know what it was? See the blog label "CIO" for the In Action post about it. Good luck! Anna, I wouldn't worry about this in terms of "when you go to two naps". Most switch to two naps at 8 months, some at 6 and some as late as 11 months (that would be my Kaitlyn). So just worry about how it is affecting life right now. See the blog label "sleep problems" for a lot of ideas on why he might be waking early. First, be sure it isn't due to a growth spurt. Good luck! Kelly, 1. For part of her life it was a dreamfeed basically. But that isn't what you would do for an older child. Typically what happens now is she wakes up about 6:30, which is 2 hours since the last feeding. So I just have her play for 30 minutes, then I feed her and put her to bed.By this point, your son might not need a fourth nap at all. Brayden and Kaitlyn no longer took a fourth nap after 4 months of age. McKenna is still taking one and has been four months for a week.2. I would drop the dreamfeed before extending your day schedule. It is normal for babies to be really fast at eating at this age. I am glad the blog has helped! Jessica, if she does keep waking in the night, I would add the DF back in to see if that fixes it. Good luck figuring it out. It could be a growth spurt. It could be the pacifier…that is a common age for problems. SR, There are a couple of options. It sounds like he doesn't need the feeding. So the trick is to figure out WHY he is waking. Is it habit? Is he cold? Is there something going on at that point?Once you discover the reason, you need to eliminate it.Then you need to re-train his habits. You can do that by helping him get back to sleep. Some do CIO. So do "wake to sleep" by the Baby Whisperer. Some just wait. Do what you think is best. Good luck!